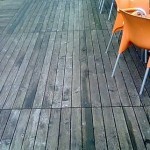 Flat roofs are known as being problematic, with many suffering leaks. However in my own experience the problems with leaking flat roofs are usually as a result of either poor workmanship installing the roof membrane, poor maintenance by the building owner or as a result of age. 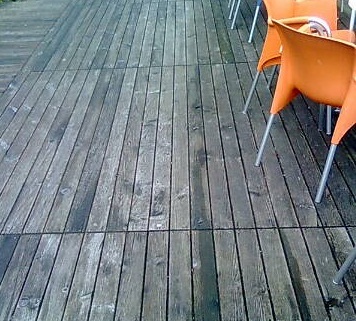 A well designed and waterproofed flat roof should not cause problems or leak. With winter approaching now is a good time to get your boiler serviced. This will maximise efficiency and ensure that it runs problem free. I think getting your boiler serviced easily pays for itself by reducing your fuel usage and increasing the boiler life span. It is important however to use a qualified person to do the work. There is a lot of equipment and knowledge required to carry out a complete service. I got my boiler serviced by a professional a few weeks ago and I took pictures of each stage of the process. I have added these below. 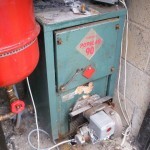 My particular boiler is a 14 year old oil fueled Firebird popular 90 type. During the summer the flue cover blew off the chimney and I had to secure it with stays. As a result during the service, water (and one snail!) was discovered inside the firebox. This is not a good way to prolong the life of your boiler. Photographs below. I recently cleared a number of large bushes and hedging in my garden. I was left with a huge amount of branches to dispose of. Normally for small amounts I would bring this to our local recycle center in a trailer but this would have meant a number of trips. 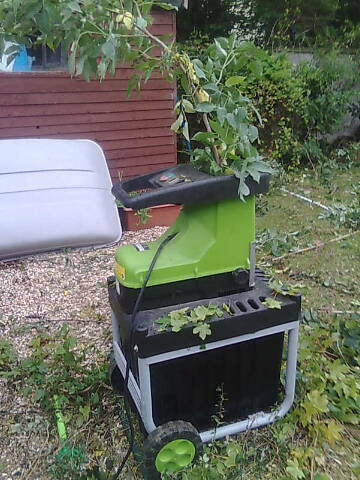 Instead I got a loan of a chipper machine from a friend and chipped all the branches and leaves and spread the resulting mulch around the larger established plants in the flower beds. It was so much easier than piling everything onto a trailer, I highly recommend it. One thing to be careful about though, is to make sure that none of your plants carry disease. 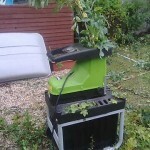 As chipping these plants and spreading it around may simply infect all the remaining plants in the garden. If you suspect this is the case perhaps the best solution would be to dry the chips and use them as a fuel in your stove/ fire or dispose of them separately. Also it is better to simply leave the mulch on top of the soil instead of mixing it with the soil. The mulch helps to retain moisture in the soil, prevents leeching of soil nutrients after heavy rainfall but importantly as the mulch decays it uses nitrogen and if mixed in with the soil it will deplete this and thus harm the growth of adjacent plants. Crack monitors types. 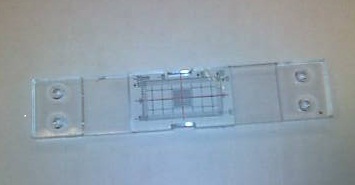 The most popular type is made with two slips of overlapping plastic plates with a red cross on one and a marked grid on the other, see picture above and below. Once this monitor is fixed in position an initial reading is taken. Then more readings are taken at regular intervals to establish if movement is occurring and if so, at what rate. By comparing the different rates of movement for cracks at different locations in a building, the cause and location of the weakness can be established. The monitors should be left in place for as long as possible to establish whether the crack is moving or not, and for a minimum of eight weeks. 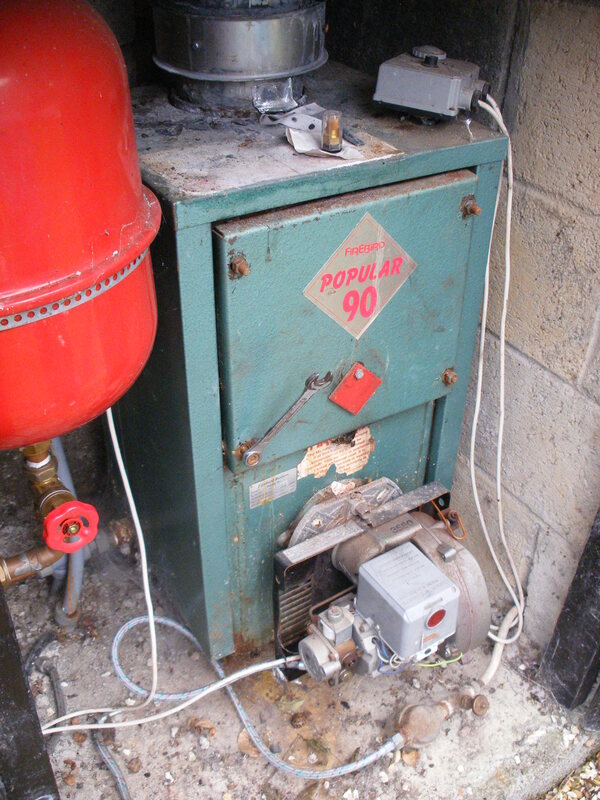 One of our regular readers, Ronan O’Reilly, has kindly written and submitted the following article to advise users on how to avoid an ignition failure in an auger fed wood pellet boiler. Thanks again Ronan. As noted in a previous article it would seem that wood pellets are the cheapest fuel to heat your home, though the set up costs are high. A modern auger-fed wood pellet boiler with adjacent pellet store will need some yearly maintenance in order to avoid what is often referred to in wood pellet boiler manuals as an “ignition failure”. An ignition failure most often occurs because the weight of the pellets in the store is not sufficient to push enough pellets into the auger.